TOWSON – ­The crew handling the livestreaming of the Calvert Hall College varsity lacrosse game April 28 settled into position in the press box at Kelly Field nearly an hour before the 7 p.m. faceoff and stayed there even after players and most fans had left following a 15-3 victory over St. Mary’s High School of Annapolis. The Maryland Interscholastic Athletic Association A Conference showdown made for a long night, but that is what the job required. While this was not an ESPN telecast, the students livestreaming audio and video of game remained focused and worked as if the Ravens were playing the Steelers. 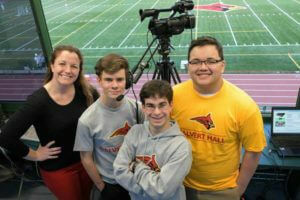 A small group of Calvert Hall students and two school staff members packed into the middle of the press box, all so that Cardinal fans anywhere in the world with Internet access could follow the action on calverthall.org. The students are part of the Communications Club, a varsity letter club which lets rotating groups work on the livestreaming. Danielle Werner, director of communications and marketing at the school, guides the livestreams, which have also covered baseball and football games. This was their second year for the operation. Werner said the livestreaming goes through Meredix, based in Evanston, Ill. 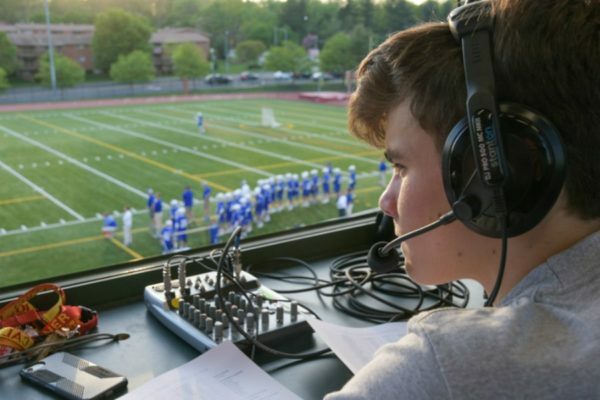 The livestreams average between 100 and 200 viewers, but nearly 400 followed a lacrosse game against McDonogh. (The livestreams are archived at meridix.com/everywhere.php?liveid=calverthall1). Two people do play-by-play and provide color commentary. Another handles the camera, another technical support. The Calvert Hall livestreams are done with just one camera, stationed in the press box. That’s a long way from an NFL game, which uses approximately 13 to 15 cameras, according to Bruce Cunningham, Fox 45 sports anchor. Brady Organt, a sophomore, handled the color versus St. Mary’s. 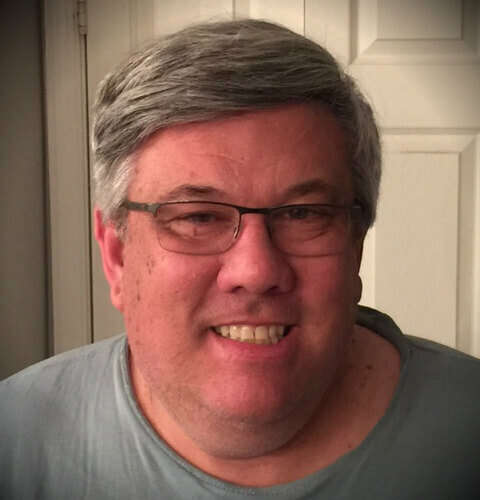 He worked alongside Michael Clark, a campus minister who handles lacrosse play-by-play. Clark, a graduate of Loyola University Maryland, simultaneously serves as the public-address announcer, a true multi-tasking experience. Alec Jara and Andrew Vida work quietly, often side-by-side, the former as a cameraman, the latter on tech support. Jara, a junior, said that an uncle films at games professionally. Vida sets up and breaks down equipment, and manages sound. The livestreaming of the St. Mary’s lacrosse game went well. There were no major glitches and, of course, the rout from the top-ranked Cardinals, who conclude the regular season May 16 at archrival Loyola Blakefield before entering the A Conference playoffs, made the home crowd happy. As everyone scurried around to clean up afterward, Werner stood off in a corner, smiling at the group’s coordinated effort. Jeff Seidel is a freelance writer for the Catholic Review.